I am currently a student at Auburn University, and I’m studying Early Childhood Education. I became a Christian in September of 2011, so the last almost-two years have been an amazing learning experience, and I’m so excited for the years of growth ahead. I love drinking coffee and learning to make desserts, especially when in the company of friends. Having critical conversations about theology and Christian living is one of my favorite interests. My friends sharpen and encourage me a lot. Although I’m a bit of an introvert, I love people and appreciate it when my roommate gets me out of the apartment. Really, I’m an ordinary person who also has the privilege of living in saving grace and enjoying God. 2) Where do you attend church? Tell us a little bit about it. My home church is Lakeview Baptist Church in Auburn, AL. It is the only church I’ve been a member of as a believer, and the elders and members/attendants are enormous blessings in my life. I don’t know where my walk with the Lord would be without the servant leadership and encouragement that I receive there. My favorite things about Lakeview are that the teaching is centered on the gospel, the leaders always encourage obedience according to the Scriptures, and the men and women, by God’s grace, exemplify biblical manhood and womanhood. I never thought twice about this until last month when I stumbled across this site in The Gospel Coalition’s site. Because I have never before heard an exposition of 1 Cor. 11:2-16, I decided to have an open mind and read through the arguments for head coverings. Every point seemed pretty convincing, and I became convicted that I had not been faithfully understanding or pursuing an understanding of the passage. I prayed about it, talked to a couple friends, and sought alternative opinions of elders, and the end result for me was that the Holy Spirit was convicting me about it. I believe, no matter how strange obedience in head coverings is in my local Christian community, that if (1) the Bible is explicit about a principle and (2) the Holy Spirit supports and confirms it with my spirit, then I am free to obey. And I want to obey, not because it adds to my righteousness in Christ, but because my freedom in Christ is partly, if not completely, freedom to obey. 4) When you saw our banner ad and initially clicked on our site, what was running through your mind? My first thought was “…what? Head coverings? But it’s on the Gospel Coalition’s Website… and I trust them… so, I suppose it’s worth checking out.” You see, I do not know anybody who wears head coverings. Up until seeing this website, I had read only one exegesis on 1 Corinthians 11:2-16, and it was the cultural perspective. I thought that head coverings were only for legalistic, heretical cults and that women who wore them were being lorded over by the men around them. But the website didn’t seem unbalanced like that at all. So I definitely felt curious to find out if my impression of head coverings could be wrong. 5) At what point did you realize a shift had changed in your mind and you were likely going to cover? Was there a certain argument that was persuasive or an objection that was cleared up? 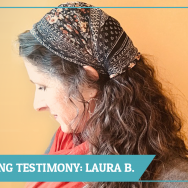 I think that after reading all of the arguments, especially the ones for creation order and nature, I felt pretty certain that I was leaning significantly toward embracing obedience in head coverings. That was when I started praying about it and asking God for clarity of conviction and faith to obey, and the Spirit confirmed my conviction. I felt excited to start this new act of obedience and unexcited at the thought of ignoring the conviction. This happened during a period of about two weeks after first visiting the website. 6) You mentioned that you spoke to friends and elders about head covering, what were those conversations like? Well, I talked to two close friends, my boyfriend, Seth, and a close girlfriend. Both were interested and had an open mind to the non-cultural interpretation and conceded that the arguments were compelling. My friend even whipped out some study Bibles of her own to continue pursuing understanding with me. It was a very sweet, sisterly experience! We agreed that head covering is a secondary issue that shouldn’t cause division and that the bottom line is that we listen to and obey the Spirit in accordance with the Scriptures. As far as elders are concerned, I didn’t talk with any elders so much as I looked for sermons/articles online by elders who I trust and listen to sometimes. Each elders’ exegesis followed the same general pattern: (1) read the passage, (2) explain the cultural context, (3) draw out some general, positive Christian messages that Paul wanted the Corinthian church to communicate, (4) explain how those messages can be faithfully communicated today without the use of head coverings. And that is all well and good, but I couldn’t get over the fact that the reasons Paul gave weren’t being taken at face value. Actually, the notes I took on the different sermons encouraged me even more toward embracing obedience in head coverings. I also got a transcript of a sermon on 1 Corinthians 11:1-16 from my pastor at Lakeview from the ‘80s and read it. Most of the sermon was about authority. On head coverings, he shared that his interpretation is that a woman’s hair is her covering but that he supports women who choose to cover. He said that it’s “a sweet and beautiful thing” (“God’s Chain of Command” by Al Jackson). And I agree with him that it is a sweet and beautiful thing. 7) What was that first Sunday like when you showed up in a covering? Did anyone say anything to you about it? My first Sunday covering at Lakeview was very normal. I got a couple of compliments on it, although I’m not sure that anyone knew what I meant by wearing it. Nobody asked about what it was or what it meant. My personal experience was good. It helps as a tangible reminder that I’m under the authority of God and elders and that it’s good to have a teachable spirit. So, I do think that it helped my heart get into a posture for learning and worshipping corporately. 8) We’ve heard many stories of women who cover for a season but due to pressure, fear or other circumstances they end up stopping. Do you worry you might have a similar experience? I have wondered about that, but I’m not that worried about it. It’s not embarrassing to wear a symbol of submission to authority or to obey God according to the Scriptures. And knowing that God’s authority supports my covering makes me feel pretty secure about it. 9) Some have objected to covering because it’s not a salvation issue. Care to share your perspective on why you decided to cover if you’re not more righteous than before? Well, let’s think about it like this: Why bother with any obedience or good works if we know that our righteousness is already established in Christ? Why not just sin that grace may abound? That’s the real question. If someone is going to use the argument that “it’s not a salvation issue” to justify disobedience, I’m worried about where else that logic would take that person is his/her Christian walk. The reality, for all believers, is that true faith in Christ naturally produces obedience. This is supported throughout the Bible. So what does all of this have to do with head coverings? Wearing a head covering is simply one area of obedience. If I really believe that Jesus suffered, died, and resurrected so that I could be clean and free to obey and love God, then I will desire to run in the way of his commandments. I have to admit that I don’t understand everything God asks me to do, but that doesn’t need to stop me from doing it. I want to hold Scripture to the highest authority, trust God’s wisdom in inspiring it, and faithfully embrace the instruction it provides. And because God’s Word clearly teaches women in every time and culture to cover their heads in church, I am definitely willing to go with it. 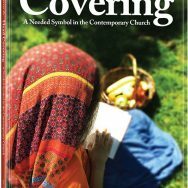 10) What kind of covering(s) do you use? Where did you get them? Right now I’m using scarves. I just tie them around my head like a really big headband. Garlands of Grace has cute coverings, and I have ordered some from them. Love this testimony! Thanks for sharing it, Ms. Elizabeth! What a testimony! God bless you! such encouraging & well-thought out responses! i commend you for your Christian maturity & challenge you to stay strong in the faith. keep listening to the Holy Spirit & reading God’s Word & God will use you mightily! thank you for sharing! Wow, it’s amazing to hear how much God has done in your life! It’s so hard to find a local person that does it too. If I were to find someone in Georgia that I could do it with, I would do it more easily. I know I need to, but I won’t. Honestly, I used to do it alone a couple times and I felt a lot safer, more protected and kind of like shielded in a way. It’s just so nerve-wracking and I know that’s to be expected but it still makes me not want to – when I know I need to. However, it would be so nice to find someone local. Elizabeth, do you think I could have your e-mail address? 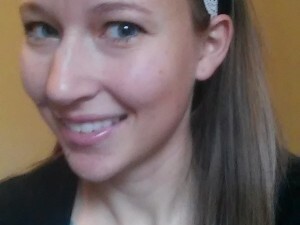 I would love to talk with you more privately than just over this site. That is exciting. I would love to talk to you about it. wonderful! my e-mail is [email protected] 🙂 I don’t know a ton about this as I am new to it myself. I accidentally just started covering my head when my hair would start looking crazy and I had not done it. haha. But then I started doing it more often and I felt so protected and more feminine even. It was really interesting! And now it all makes sense and even when I do my hair, I still cover it in some way. I feel naked without it. Your story blessed me! It challenged me to continue being open to God and listening to what He asks of me….no matter how hard it is. I also wear a head covering but am surrounded by other sisters in Christ that do, so I am inspired to see you stand by yourself in this choice! Good for you, starting this out at a young age. I am glad to hear your boyfriend is on board with this too. For many of us, talking to our dh’s about how God had been leading us was nerve wracking b/c we did not know how they would respond. I hope that in time others around you will be inspired and start to cover. It has been a blessing to find this group. Update: Since I started covering I’ve been so blessed to become a wife and mom! This is my little family at baby Joseph’s dedication. It’s been about 2 years, and I still am convinced that I should cover even though I know virtually nobody (in my personal life) who agrees. Ladies, stick to your convictions no matter what, knowing that we seek to please God and not men! So encouraging!!!! Thanks so much for posting this pic @disqus_BWpWnwknE6:disqus. Congrats on the marriage and now baby Joseph.